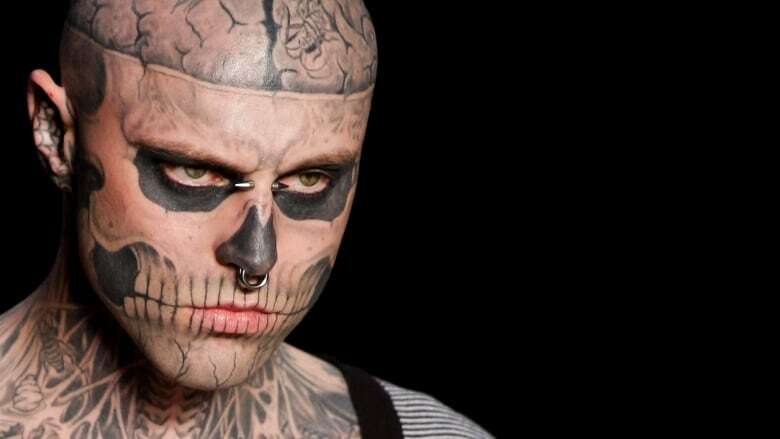 Rick Genest, known as Zombie Boy, has died. He rose to fame for his head-to-toe tattoos. Montreal model and artist Rick Genest, also known as Zombie Boy, has died, police sources have told Radio-Canada. Genest was 32. Genest came to the public's attention after tattooing his body from head to toe, including images of a skull and brain on his head. He holds a Guinness World Record for most insect tattoos (176) and another for most human bone tattoos (139). Police sources told Radio-Canada that ​Genest died in Montreal's Plateau–Mont Royal borough around 5 p.m. ET on Wednesday. The sources said police are classifying his death as a suicide. The Quebec coroner's office says it is still investigating the cause of death. The Montreal paramedics organization, Urgences-santé, said it could not comment on the circumstances surrounding his death, but said it had been related to a fall. Genest's manager, Karim Leduc, said in an interview with CBC Montreal's Homerun Friday that he believed the police had been too quick in their classification of the death. "The circumstances are quite mysterious and the pieces of the puzzle just don't fit together perfectly," Leduc said. He believes Genest's death was an accident. Lady Gaga tweeted Thursday night that the news is "beyond devastating." Genest was born in the Montreal borough of LaSalle, grew up in the off-island suburb of Châteauguay and spent part of his life living on the streets. He got his first tattoo at 16 and left home the following year. About 90 per cent of his body was eventually tattooed, and most of it is by Montreal tattoo artist Frank Lewis, according to the Guinness Book of World Records. The extent of Genest's tattoos led him to work in sideshows and then garner an online following. "He was someone who was a prisoner of that image," said Pénélope McQuade, host of Radio-Canada's Les échangistes, who interviewed Genest in 2016. The British artist Marc Quinn is slated to create a 3.5-metre bronze sculpture of Genest for London's Science Museum next year. "I find him rather amazing. He is an artist. His artwork is himself," Quinn told the Guardian newspaper in March. The last post on Genest's official Facebook page, which has almost one million followers, is a poem called The Well. Fans have posted an outpouring of grief in the comments.